What Were the Themes of Egyptian Art? 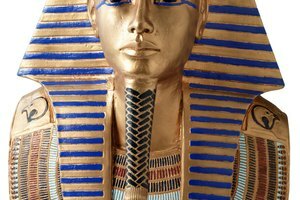 How Did Ancient Egyptians Decorate a Sarcophagus for Pharaohs? Funeral mask of King Tutankhamun. 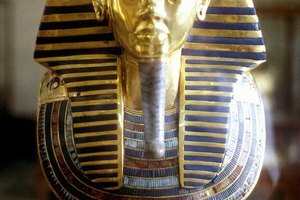 Just as the painstakingly prepared mummy of an Egyptian ruler or noble was placed in the sarcophagus, a high priest touched the mouth, eyes, ears and nose of the funerary mask in the "Opening of the Mouth" ceremony. The re-animating ritual was a critical part of the passage from life to life-after-death because the deceased was en route to answer questions about his conduct that would determine his blessed or condemned state for eternity. Entry into the afterlife was as ritualized as every other aspect of Egyptian civilization. The Egyptians believed that the afterlife was a glorified continuation of earthly life and elaborate preparations were made to ensure the deceased maintained an acceptable standard of living. Grave goods piled around the bodies of royalty and the high-born included large amphora with stores of grain, wine, beer, cheese, slabs of ox meat, bread, dried figs and other comestibles. Store rooms held a palace-worth of furniture from gilded chairs to cushioned daybeds. Separate brick-lined tombs contained entire boats -- boats were a sign of the wealth and power of a nation built around the Nile River as well as vehicles for passage to the underworld. The corpse itself was heavily adorned with jewelry, sacred amulets and finely-woven linen. Important figures were accompanied by household servants and family members -- some tombs and adjacent burial grounds contained several hundred graves of people who may have swallowed poison for the honor of accompanying their lord in death. Osiris, the god of the underworld was a stern judge of who had lived a life of merit and deserved a blessed afterlife. 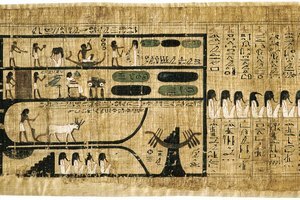 The "Book of the Dead" tells of a ceremony in which the newly-deceased stood before Osiris, presented with a list of mortal transgressions. A scale held a single feather on one side and the dead person's heart on the other. For each sin, the deceased was asked to own up to it or deny it. If the assertion was true, the heart weighed as much as the feather, which represented truth or Ma'at. If the scale tilted, the judgment went against the dead person who was denied eternity with the gods and tossed to a terrible monster who would devour his heart. Sarcophagi were the fitted caskets that contained mummified remains of important Egyptians. They were made of stone or clay with wood facings that could be decorated or sculpted with plaster to resemble the deceased. 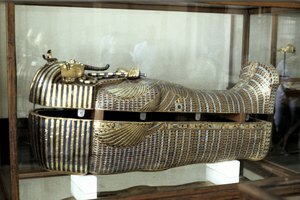 A few sarcophagi were made of silver or gold. The most impressive caskets are nested sarcophagi with the inner one constructed of painted wood. Sarcophagi were works of art, richly colored with scenes celebrating the illustrious life of their inhabitants, depictions of activities in the afterlife, and excerpts from the sacred Books of the Dead. 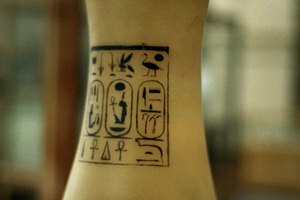 In some cases, the hieroglyphics inscribed on the caskets are the only extant copies of specific books. Portraits of protective goddesses also decorate the sarcophagi. Powerful Isis, mistress of the gods who resurrects the dead, is accompanied by her son Horus, her sister Nephthys and other goddesses such as Neith and Selket who guard the organs of the dead that were removed for embalming. Mummification preserves the body of the dead person, who will need it to continue living in the underworld. The invasive process alters the corpse so a funeral mask was created to present the most youthful, vivacious and idealized face the body would have worn. 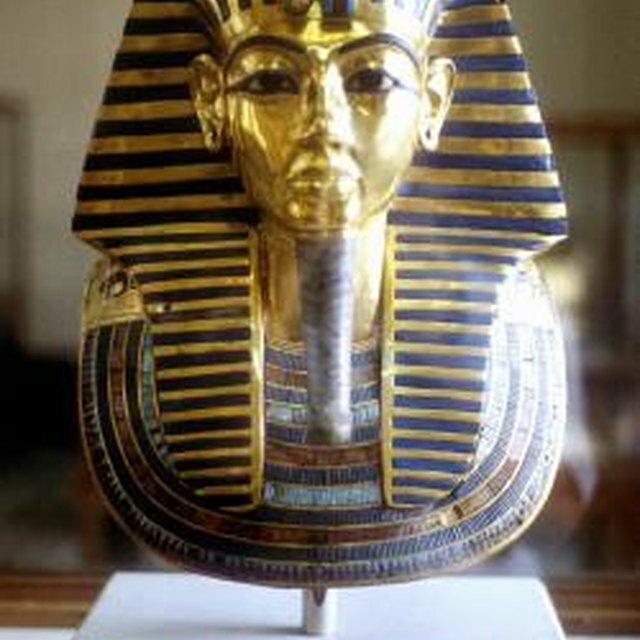 Extremely wealthy people had gilded cartonnage masks -- a form created of many layers of glued linen or papyrus which hardened into a mold that could be painted, covered in plaster and decorated, or overlaid with gold and precious gems. The gleaming, bejewelled funerary mask of the young Tutankhamun is a widely-recognized tomb artifact. His great grandmother, Thuya, wore a similar gold mask. Lesser mortals had simple painted masks made of clay, plaster or wood. Why Were Pyramids So Important to Ancient Egyptians? What Egyptian Gods and Goddesses Were Associated With Egyptian Burials and Deaths? Crawford, Benna. "Egyptian Afterlife Ceremonies, Sarcophagi & Burial Masks." Synonym, https://classroom.synonym.com/egyptian-afterlife-ceremonies-sarcophagi-burial-masks-12085313.html. 29 September 2017. What Are the Jars That Held Organs in Ancient Egypt?